Q:What is my Mill Rate? A: One mill means $1 of taxes per $1,000 of assessment. Q: What period of time does my motor vehicle tax bill cover? A: A motor vehicle on the regular Grand List (bills received at the end of June) covers the time period from October 1st to the next September 30th. A motor vehicle on the Supplemental Grand List (bills received at the end of December) covers the time period from the month the vehicle was first registered to the next September 30th. Q: I received a tax bill for a motor vehicle I no longer own; doesn't the DMV notify the town when a motor vehicle is sold? A: No. 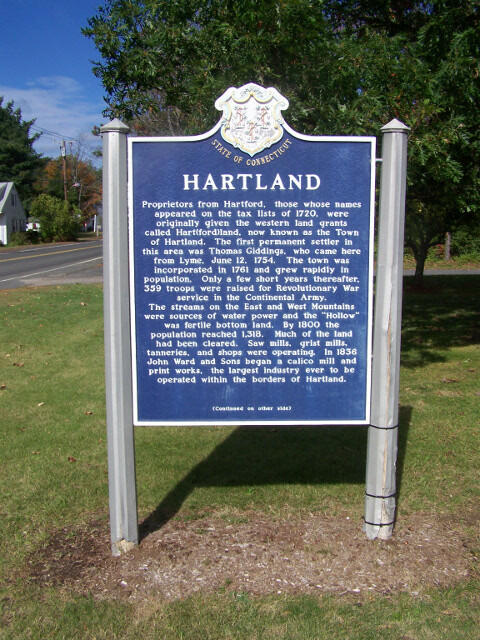 The DMV only provides this office with a list of any vehicles registered in the Town of Hartland. They do not notify us of any vehicles that are no longer registered. A motor vehicle tax bill covers the period from October 1st (Grand List year) to the following September 30th. If you transfer your registration plate to another vehicle, after October 1 and prior to August 1 of the next year, a tax credit will be automatically applied to the first bill for your new vehicle. This assumes that the taxes have been paid in a timely manner. The taxpayer is not involved in this process. If you sold your vehicle and did not transfer the plate to another vehicle, you may be entitled to a tax credit. In this scenario you must provide proper documentation to the assessor, it is NOT automatic. Q: Do I have to pay the entire tax bill if I no longer own the vehicle? A: If you did not own the vehicle on October 1st, you are not responsible for that Grand List bill, but you must provide this office with proper documentation that you did not own the vehicle. If you disposed of the vehicle after October 1st and before the next September 1st, you may be eligible to have the bill prorated upon presentation of proper proof. Prorates are based on the month in which the vehicle was disposed. Vehicle tax bills can only be prorated if proper documentation is provided to this office. Documentation must show that the vehicle was sold, totaled, junked, or registered out-of-state. Q: How did you arrive at the value of my vehicle? A: Connecticut Assessor's utilize the National Automobile Dealers Association (NADA) guide for motor vehicle valuations. We use the "Truck Blue Book" and "Older Truck Blue Book" to price trucks. These are the guides recommended by the Office of Policy and Management each year. We also use various other guides for vehicles that are special interest or too old to be listed in the N.A.D.A. Pricing Guide. The assessment reflects 70% of the published "retail-selling price" as of October 1 of each year. The assessment does not reflect vehicle condition nor mileage factors. If you feel your vehicle should be assessed at a lower rate due to these factors, you may appeal the assessment to the Board of Assessment Appeals. Q: How do I appeal the assessment on my vehicle if I believe that the value is incorrect? A: The first step would be to contact the Assessor's office to insure that the vehicle descriptive data is correct and that the assessment was correctly applied. If this does not resolve the issue, then you may present your argument before the Board of Assessment Appeals (BAA). The BAA convenes twice per year, in September and March. The September hearings are for Motor vehicle appeals (only) and are "walk-In" on a first come first serve basis. During the March hearings the BAA hears arguments for all types of taxable property (Motor Vehicles, Real Estate, and Personal Property) by appointment only. Please contact the Town Clerk's Office (860-653-0285) to get exact dates. Application forms to appear before the BAA will be available in the Assessor's Office in January, and must completed and returned to the Assessor's Office by February 18th. Q: What is the assessed value of real estate based on? How can I find out what my assessment is? A: Assessments represent 70% of the market value of the property as of the date of the last revaluation (October, 2010). Most information in the assessor's office is open to the public. Basic information (such as title and assessment) will be provided upon telephone request; detailed information will be provided at the office or upon written request.